Sculpture in Context -09, National Botanic Gardens, Dublin. Permanent collection of National Museum of Ireland, Collins Barracks. Sub Rosa - Under the Rose, detail. 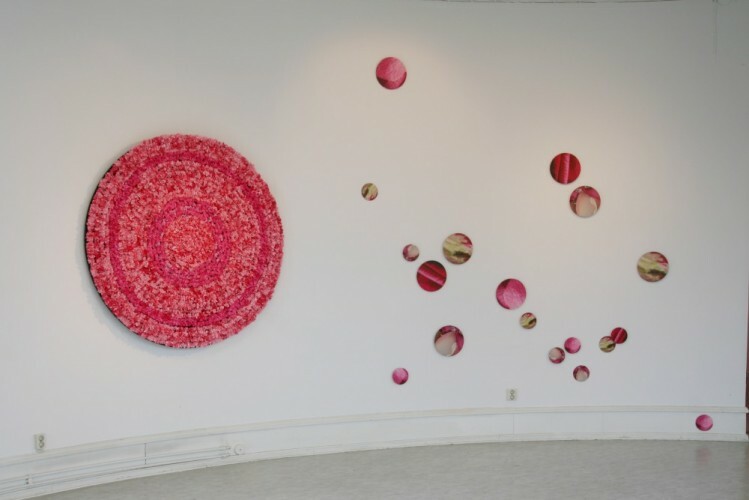 Permanent collection of Region Skåne, Malmö University Hospital, Sweden. The rose gives a message of mystery and secrecy. It is beautiful to look upon in a garden but prickly to touch. It is tightly closed as a bud, but in full bloom opens to show its inner private parts. As we now, things in life are not always what we at a first glance might think. Rosewater, made of petals and water, gives a connection to cleansing. Bathing in rosewater was enjoyed in ancient Rome, as it was considered to have antibacterial and antiseptic properties. In some Hindu and Muslim rituals rosewater is used to purify the body as well as to cleanse the spirit. The act of plucking the petals to make rosewater become an important act to me. The pile of petals that grew was soft, brittle and very beautiful. In the pile was a secret hidden. As I worked with the roses I discovered that the petals have a very textile like character, both to touch as well as visually through the macro lens. This fascinated me. Sub Rosa originates from Latin, literally ‘under the rose,’ and means an emblem of secrecy.